Note: This post includes Affiliate Links* to products I’ve personally used and love. You don’t need a curriculum to teach science. Yes, you read that right: you really don’t need a curriculum to teach science! And while I’m not a science teacher per se, I have homeschooled for more than a few years, and have friends who can claim the status of trained “professional science teacher” on a résumé. 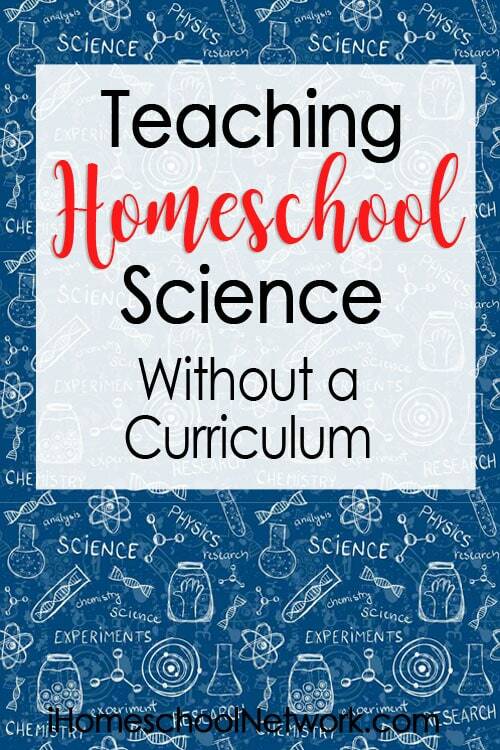 But for those of you who may not fall into the “professional” camp, or who may not even favor the subject at all (yet), here are some tools for teaching science in your own home, without a curriculum. One of the problems I experienced with science while growing up, and also in my early years of teaching the subject, was a poor choice of curriculum. It seemed to me that science texts, for whatever reason, were often dry treatises on topics that I had neither an understanding of nor a vision as to how they connected with “real life.” Additionally, as a teacher, I had no confidence in the subject matter either, and feared that lack would result in the ruination of my children’s academic training and future. Unless your child is headed for a career in science, “gaps” are not an issue. In the early years, science should be connected with delightful discoveries and practical life lessons. Focusing on growing a curious, questioning approach to learning in general will go far towards helping your child in later science learning. So the question becomes: how do I do all that? The first tool you may want to use is the Typical Course of Study that WorldBook (yes, the makers of those big ol’ sets of encyclopedias that many of us might still have on a shelf!) has crafted together. Why? WorldBook has been around for many years, and while they might not corner the market on knowledge, they do have a great handle on age-appropriate presentations of many topics. (Actually, they offer scope-and-sequences for grades 1-12 on a bunch of subjects on their website. It’s a very useful resource.) You can use this to outline a general course of study for your child for a year, or print it out and use it as a “checklist” as studies are completed, or keep it handy as you come across materials and find activities as you pursue delight-directed learning. It can become a way to maintain an overview of your child’s studies year by year, and a source for introducing different aspects of science when you’re not quite up to speed on what to study…(speaking from experience). Another tool you may want to use is your local library’s Dewey Decimal System. 900 – History & geography – Look for biographies of famous scientists and inventors here. Amazon has a dizzying array of science kits and collections. Looking through this collection* is a fun way of exploring options and finding new interests both for you and your student! Pitsco Education supplies lab equipment and products to traditional schools, too, but they are also homeschool-friendly. I’ve used both their solar cars and kite kit with my daughter’s homeschool Science Club. Homeschool Planet has some wonderful deals on Discovery Video Streaming*, Supercharged Science*, National Science Foundation streaming*, and more! Best of all, you’ll be DOING it! Find additional resources, tools and encouragement at How To Teach Homeschool Science Out-of-the-Box. Hi Pat, above you mention the scope and sequence that World Books offers for printing out. Could you be more specific on what Website to find that, and where.